MEDELLIN, Columbia, April 27, 2018 – Led by a six-for-six performance from two-time Olympian and four-time U.S. champion Sam Mikulak of Newport Coast, Calif./U.S. 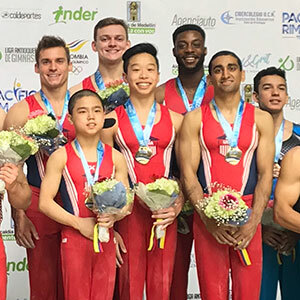 Olympic Training Center, the U.S. men won the team title tonight at the 2018 Pacific Rim Championships in Medellin, Colombia. 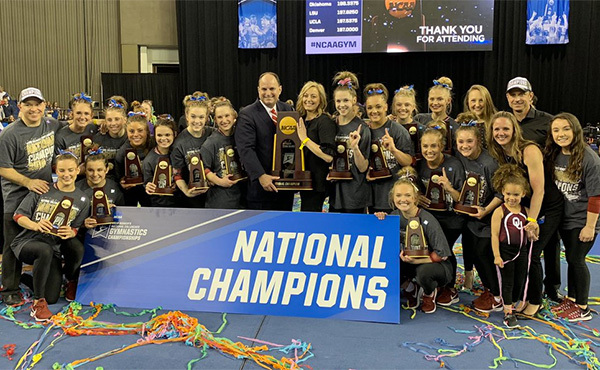 Mikulak won the senior all-around gold and Lazarus Barnhill of Houston/Cypress Gymnastics, added a third gold for the U.S. men on the night, taking the junior all-around title. 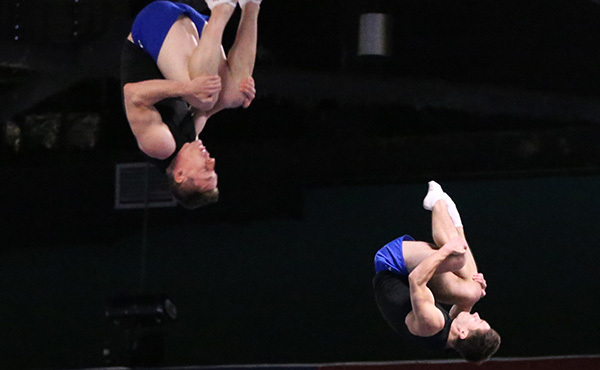 The U.S. men totaled a 330.300 to win the gold medal, followed by Canada (309.850) and Colombia (306.200). 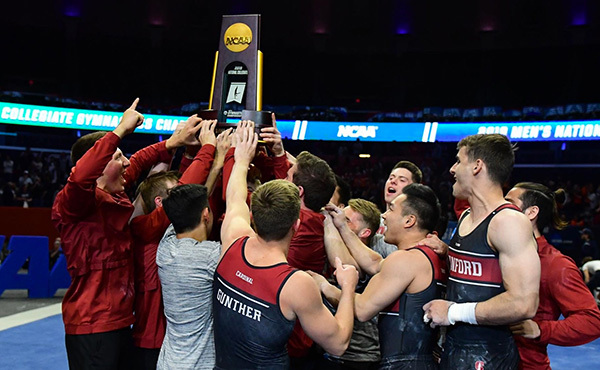 In the senior all-around competition, Mikulak’s 87.700 total gave him the gold medal, followed by teammate Akash Modi of Morganville, N.J./Stanford University, who scored 83.500. The bronze medalist was Colombia’s Carlos Calvo with an 80.050. 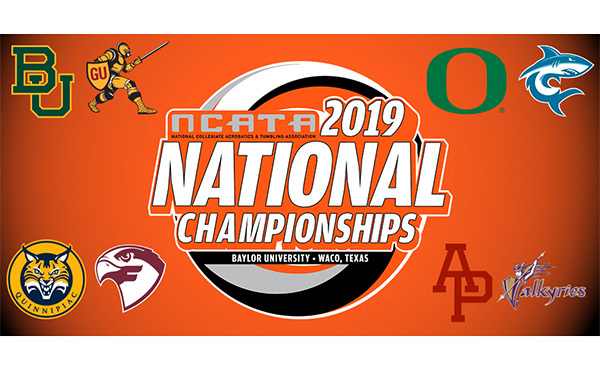 Barnhill won the junior men’s all-around crown with a 77.800 total. Asher Hong of Tomball, Texas/Cypress Gymnastics, who tallied 77.700, took the silver. David Sandro of Canada earned a 77.500 total to win the bronze medal. In the opening rotation, Mikulak led the team on the floor exercise with a 14.250. He tumbled a front double twist to a double front and a front layout to double front half out to open. He nearly stuck his two-and-a-half twisting dismount. 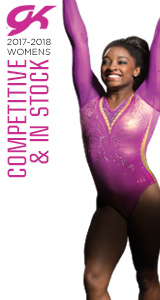 Modi was close behind with a 13.850, tumbling a piked double front and a back two-and-a-half to front double full. Barnhill earned a 13.650 with Hong adding a 13.200, giving the U.S. a 54.950 on the event. Mikulak’s 15.150 again led the team on the pommel horse in rotation two. He opened with the Mikulak – a scissor that travels from end-to-end – then swung cleanly up to handstand and back down. Marvin Kimble of Milwaukee/Salto Gymnastics, added a 14.650 with Modi right behind at 14.550. Hong’s 13.500 gave the U.S. a 57.850 total on the event. On the still rings, Mikulak opened with a back uprise to Maltese, followed by a back uprise to legs together cross. He stuck his double-twisting, double back for a 14.350. Modi added a 13.900, executing an Azarian cross to Maltese and a tuck double-double of his own. Hong and Justin Ah Chow of Miami/Universal Gymnastics, added 12.900 and 12.800, respectively. The U.S. ended the rotation with a 53.950. 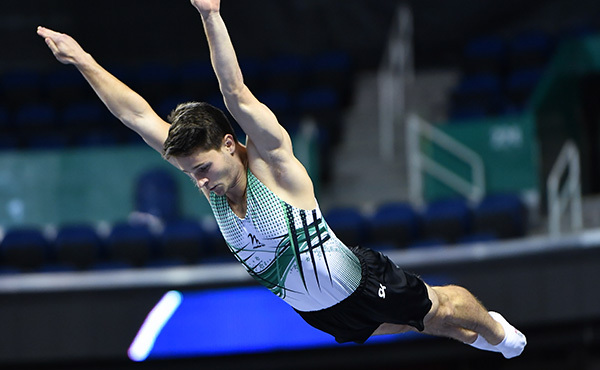 The U.S. posted a 55.050 on the vault, behind Mikulak’s 14.200 on his Kasamatu one-and-a-half. Barnhill added a 13.750 for his Kasamatsu half, while Ah Chow’s Kasumatsu full earned a 13.600. Modi rounded out the team with a 13.500. Mikulak and Modi posted matching 14.950 scores to lead the team on the parallel bars. Modi went first, executing a peach, giant Diamidov, giant to Bhavsar sequence before dismounting with a tucked full-twisting double back. Mikulak’s routine included a peach half, peach, giant Suarez and a double front dismount. 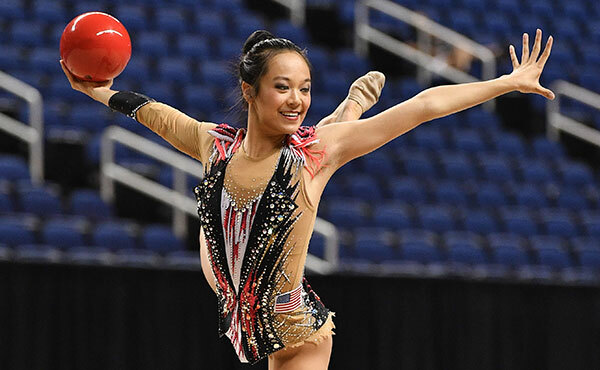 The USA’s 56.750 team total also included Hong’s 13.600 and Ah Chow’s 13.250 scores. In the final rotation, Mikulak closed the meet out in style, last up for the USA. He swung cleanly through a Cassina and a Kohlman, before executing several Tkatchev variations. He stuck his layout double-double dismount to score 14.800. Modi, Barnhill and Hong added scores of 12.950, 12.350, 11.850, respectively. The U.S. closed the meet with a 51.950 total on the event.